Personalize any Barbie or other doll with its own unique crochet clothing. You can make designs that look like what your child wears so she can have a "mommy and me" experience with her doll. You can crochet designs that reflect your culture, society, or beliefs, making Barbie more in line with your family's style without compromising your child's love of the doll. Crochet doll clothes don't use a lot of yarn, so they are a great way to use up leftover yarn from your stash. Make a whole wardrobe of crochet Barbie or doll clothes, starting with these eight free crochet doll fashion patterns. Emi Harrington on Ravelry offers a set of six crochet doll patterns as a free download. This set of patterns includes a cape, a shrug, and a skirt as well as three accessories: a hat, a cowl and a purse. 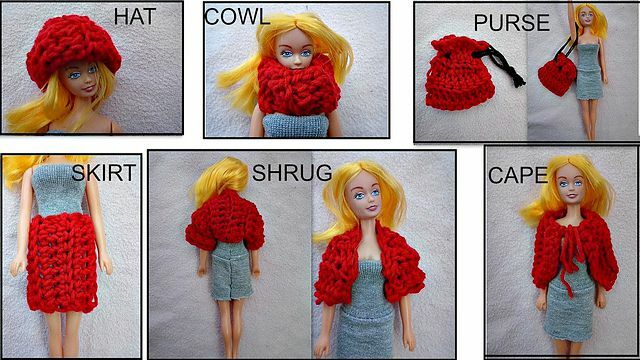 You can crochet them in a variety of colors, and create a big mix-and-match Barbie wardrobe. The American Girl doll comes in just after Barbie for popularity. A free Ravelry crochet capelet pattern from Danielle Bonacquisti is designed for her, or for any other doll that is approximately 18 inches tall. The same crochet pattern could be used as a doll skirt, especially if you add a drawstring to adjust for size. Is It a Toy is an adorable amigurumi blog that features many free crochet toy patterns. There is also a free crochet pattern set for a jacket, trousers, and matching hat that can be worn by a doll. The instructions for the jacket come in two different sizes, so it can be made to suit different dolls. This also shows you how to scale the pattern up and down; you can use this technique to turn doll clothes into baby clothes. Designer Karen Glasgow Follett collects vintage 1960s dolls including Liddle Kiddle dolls, which have large heads but small 2-inch bodies. Oftentimes she finds that vintage dolls look messy only because they need new clothes, so she offers a free crochet doll dress pattern for like-minded collectors. A cute free crochet pattern set from Idea Ivana includes a colorful onesie, a granny stitch hat, and matching doll slippers. The outfit is worked with bulky yarn and a mid-sized hook, so it works up quickly to create a beautiful finished project. Its crochet doll outfit is for 12-inch dolls, but it includes instructions for adjusting the size to fit Barbies, American Girls, and all other types of dolls. Family Traditions Crafts on Craftsy is a shop that offers a wide array of crochet patterns for babies as well as several cute designs for dolls. The short overalls for 18-inch dolls are a terrific example of an item that you can't find in the store and your doll needs to have. Don't let your dolls go bare bottomed. Use a free crochet pattern from Julia Bremer to make undies in all colors for your little dolls. The designer has additional crochet patterns for sale on Ravelry, including a cute sundress.